There are two major factors at work when using green light to attract large fish: light and perception. With a short wavelength range of 495-570 nm, the light beam is very effective in penetrating water. This prevents scattering and creates a more focused beam on the water. During application, tiny zooplanktons are naturally drawn to the light because it triggers reproduction cycles in the organisms. The gathering of zooplankton also attracts other types of fish in the food chain, such as bait-fish and shrimp. This process continues until predatory fish emerge at the outskirts of the light, waiting to capitalize on the gathering. If done correctly, individuals on the boat can easily bait the large fish with minimal effort. Blue light can also be used to initiate fish gatherings in the water. However, the practice is mostly applied in bodies of saltwater. According to UW Sea Grant Institute, green and blue lights have the greatest penetrative value for night fishing. 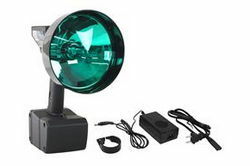 Green light can reach depths as far as 125 feet in deep and clear water, while blue light can reach over 150 feet. It is important to consider that blue light does not penetrate shallow and turbid water efficiently. For such applications, green and yellow lights are used. With focus on green light applications, a study published in The American Naturalist in 1953 from the University of Michigan verified that most zooplankton are drawn to specific light wavelengths and intensities. During the trials, scientists exposed the organisms to a wide range of colors, and found that the creatures have a tendency to avoid light (by swimming downwards) with wavelengths less than 5,000 angstroms. When researchers exposed the zooplankton to light with wavelengths greater than 5,000 angstroms, the creatures started to swim upward, towards the beam of light. In dark, nighttime conditions, rod cells found in the eyes of fish become increasingly active, and the creature is unable to perceive colors accurately. Furthermore, this is also the same reason experienced anglers use shiny or glow-in-the-dark lures at night. In low visibility conditions, fish rely on smell and vibration, and only utilize their vision at close ranges. The type of fish in the water may also dictate the type of luring method used during fishing. For example, inshore fish are able to see a wider spectrum of colors better than pelagic fish, which are only capable of perceiving few colors outside of black and white. The feeding behavior of fish varies greatly, depending on their reliance on cones and rods. In bright, daytime conditions, fish use cone cells to locate prey or small fish around the area. The process is straightforward: predatory fish stalk their prey and eat it- usually head first. When it gets dark, large fish use rod cells to adapt to the change in environment. Their stalking habits also become less aggressive, as they take a strategic position below their prey in order to see them better against the surface of the water. This is why when using the green light technique, anglers must cast below the group of small bait-fish and plankton, where larger fish are lurking. There are several points to consider when using green light to attract fish at night. Before shining light in the water, one must first make sure that the boat is anchored down firmly. Drifting forces zooplankton and small fish to catch up to the light, greatly hindering the gathering process. Using the “10 percent of the water holds 100 percent of the fish” concept, individuals should also setup their gear in a prime location where fish are known to linger or populate. If zooplankton does not appear after 30 minutes of exposure, it might be worth moving to a different part of the lake. It is best practice to use two lights (one light is ideal for small boats) with a three to four-feet gap in between the beams. The application of multiple lights would allow the angler to experiment with different types and colors of light. When shining the light in the water, one should never lower the fixtures to the bottom of lake. Instead, leave the light submerged no deeper than three feet from the surface. Researchers from the Swedish University of Agricultural Sciences (SLU) have also been able to utilize the green light technique in commercial fishing operations. To attract Atlantic cod in the Baltic Sea, some groups have attached battery-powered luminaries on their fishing pots. The application of green light has allowed local fishermen to catch up to 80 percent more Atlantic cod that are within the legal minimum length set by commercial regulators in the area. Choosing the right type of lights to implement may improve one’s success rate during nighttime fishing. The three most common types of fishing lights include the following: floating fishing lights, spotlights and submersible fishing lights. Floating fishing lights stay on the surface of the water, usually equipped with a Styrofoam ring to help the fixtures stay dry. Such units may either be battery-powered or wired from the boat’s main power source. The beam of light is typically pointing downwards into the water for maximum exposure. Submersible fishing lights are equipped with weights to help the units stay underwater. Some versions come with a weight clip that can be adjusted, based on the depth preferences of the angler. Lastly, spotlights are used to initiate zooplankton gatherings from the boat- typically from a mounted or handheld position. Such fixtures may also be battery-powered or support 12-volt cigarette plug compatibility.